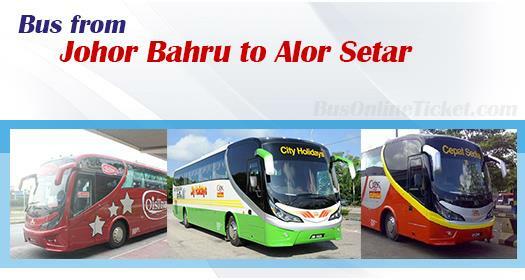 Bus from Johor Bahru to Alor Setar is the fastest transportation option to travel to Alor Setar from JB. Alternative transportation option is by train, however due to slower speed, people prefer to take bus than train. There is no budget airline servicing Johor Bahru to Alor Setar and commercial airline is always much more expensive. Thus, bus from Johor Bahru to Alor Setar is always preferred choice of passengers. CityHolidays Express and Qistna Express are the two coach companies providing bus from Johor Bahru to Alor Setar. The journey duration is about 11-12 hours, which is faster than taking train. Coach will stop for at least 1 washroom break. The Johor Bahru to Alor Setar Bus Ticket is in the range of RM 77.20 – RM 85.00. It is always better to book bus ticket in advance to avoid disappointment, due to limited trip daily from Johor Bahru to Alor Setar. The departure point for bus going to Alor Setar in Johor Bahru is at Johor Larkin bus terminal. As for arrival point, all coaches will alight passengers at Shahab Perdana A1 bus terminal. Besides faster speed for coach, coach is usually more comfortable than train because of full reclining seat and air conditioning bus. Besides the newly launched 7-Eleven cash payment, BusOnlineTicket.com also provide payment options of credit card, Paypal, internet banking like Maybank2u, Cimb One Click etc for online booking. With these various payment options, BusOnlineTicket.com ensures that all levels and all groups of passengers (be it student, working adult, tourists or senior citizen) can always book the Johor Bahru to Alor Setar Bus Ticket online with various suitable payment options provided.